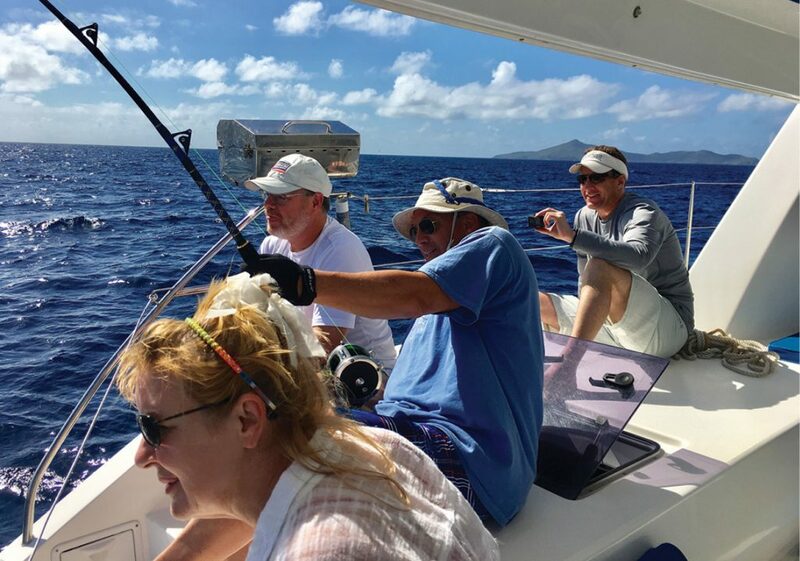 Editor’s note: Flotilla cruising is an excellent way to enjoy an unforgettable charter vacation, particularly if your sailing experience is limited. And you won’t find nicer or more capable flotilla leaders than Heather & Nate Atwater, who lead Offshore Sailing School’s Colgate Sailing Adventures® Flotilla Cruises to exotic destinations around the world. 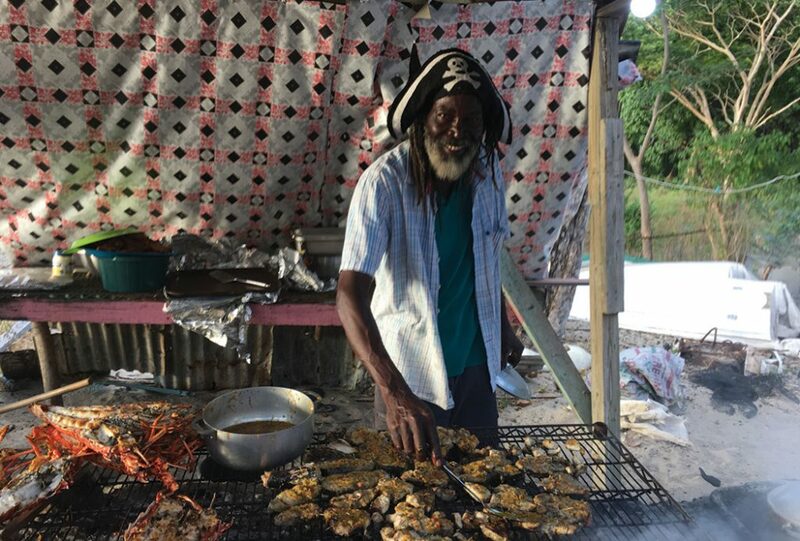 In this article, Heather recounts a recent trip from St. Lucia to Grenada. Most of the crew arrived early to the Moorings/Sunsail Base in St. Lucia, and we were granted access to our boats earlier than expected. 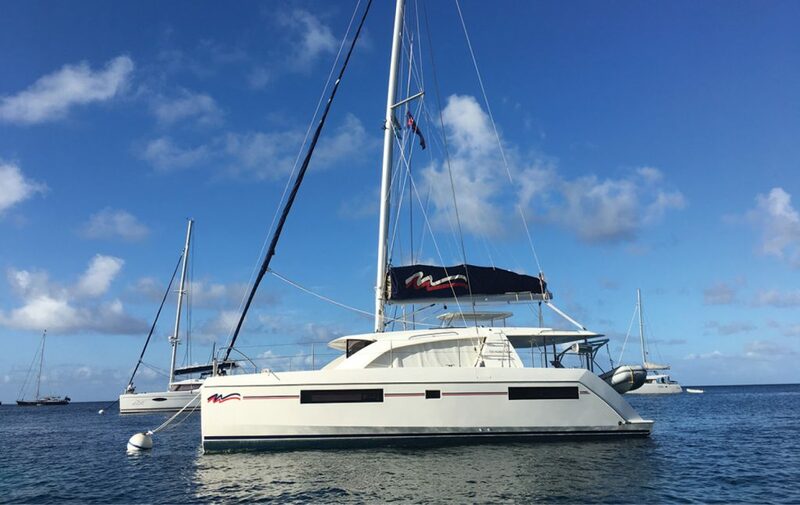 We chartered Jean Harr2, a Moorings 4800, Catty Shack, a Sunsail 454, Viva, a Sunsail 404 and All In, a Moorings 4000, and with 23 souls aboard for eight nights, I was grateful to have four catamarans for our sail to Grenada. Everyone was helpful with stowing the provisions I had procured from Massy’s Supermarche in Rodney Heights, including 22 boxes of fresh veggies, fruits, cheeses, steak, chicken, fish, snacks, etc. After the flurry of stowing baggage and provisions, we had time to exchange money at the bank nearby and purchase beverages for the trip, before the Meet & Greet dinner at Elena’s Restaurant, which is right on the water next to the base. Doug, a Canadian who had been traveling for more than 48 hours, arrived moments before the party began. So with only Paul, absent but due to arrive at midnight, we all gathered to break bread for the first time. We could have a rum drink or choice of beverage, then a choice of entrees ranging from their world-famous pizzas to mahi mahi, salads, fish & chips, or ribs, then carrot cake, chocolate cake or their homemade gelato…Yum! After we gathered additional items for each catamaran, ice and coolers, etc., we left Rodney Bay by 10:30 am to sail to the iconic Pitons further south on St. Lucia. It was a lovely sail of 18 nautical miles with winds from the north/northeast on a beam reach past the town of Soufriere. The boat boys were very persistent. Even after declining their help, one young boy grabbed the mooring we were heading to and demanded we pay him for his fuel even though we had politely told him we did not need his help. So sailors, beware. We had been advised where and which boat boys to use by Sunsail, but sometimes you have to decide how you want to handle it yourself. (For those of you not familiar, a boat boy is someone who either helps you onto a mooring for a small fee or helps you find a mooring for a larger fee, or he may own the mooring and charge an even larger fee…each situation is different. I have no problem paying for a service I want, but some situations can be confusing to decipher. Once Jean Harr2 was secured to the mooring, we went for a swim and Chad and Duane christened their new GoPro7s and explored the area. As happens on boats, things don’t always work right the first time. There is a lot of trouble-shooting and ingenuity required, so just be ready. There had been concern expressed about a steering issue aboard Viva. Nate went to Viva to trouble shoot, checked the radios on each boat to make sure they were set to max MHz, and did more radio checks. We noticed it looked as though Viva’s crew had not let their mainsail out far enough, so Nate discussed this with them and I decided to sail with them the following day. Aboard Jean Harr2, we cooked a nice dinner of chicken with garlic and onions, seasoned brown rice, and sautéed vegetables and enjoyed the gorgeous Pitons and our perfect sunset backdrop. Settling into our new surroundings, Elizabeth, Jack, Katrina, Duane, Chad, Nate and I got to know each other better. After boat briefings, we dropped our moorings at 7 am and sailed south with a brisk northeasterly of 10-25 knots. I had jumped ship from Jean Harr2 to sail with Viva for the day. The Sunsail 404 is tricky to trim properly in that the sailplan, which has a lot of area in the main, makes the boat want to round up. This was understandably a bit unnerving for the crew on Day 1 when they tried to head off and couldn’t, but if you de-power the mainsail you can achieve your desired helm, which should be a slight weather helm with good maneuverability. We worked hard on sail trim, letting the power out of the huge mainsail to balance the boat and maintain proper steerage. Viva’s crew would perfect this technique throughout the week, and on that day we got the 404 cruising along at 8.1 knots in the puffs and were the second boat to reach the mooring in Bequia…but who’s counting? Hey, this is what flotilla sailing is about: you are constantly learning. Nate and I learn new things on each flotilla. It may not be an easy lesson, but if we are not learning we might as well be banging our heads against the hull! 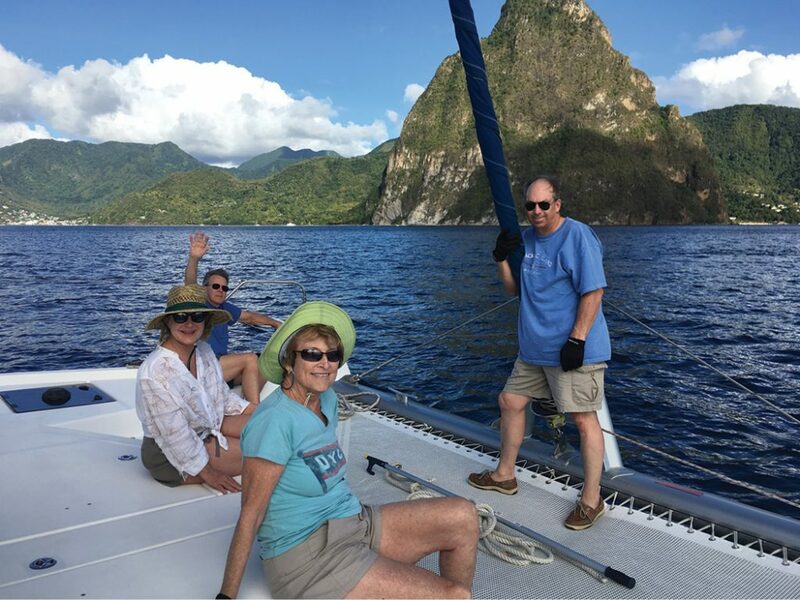 Reality check: We were sailing in tropical Saint Lucia…82 degrees, sunny, palm trees swaying on lovely beaches and Pitons of two types (mountain and beer), while our family and friends back in the USA and Canada were experiencing a record-breaking polar vortex. We are blessed! That evening we all gathered at Mac’s Pizza and Restaurant on the waterfront to enjoy a relaxed, pleasant meal together. We did all get moorings, and gathered at “New Basil’s” for dinner. We were seated at two large tables with a booth shape, comfy throw pillows, and decorator chandeliers. What we did not know ahead of time was that it was the last night of the Mustique Blues Festival. Although I felt the restaurant was a bit expensive and foofy-doofy with island-time service, it truly was an amazing spot and the music that followed dinner was quite exceptional. As usual, the ladies, Diana, Jan, Maureen and I, hit the dance floor and had a whoopdy-doo time dancing our feet off. Nate even danced one dance with me, which is a rare, special occasion. We commented that the musicians were very talented and we were lucky to have them performing for us in such a small and personal venue. We all let off a lot of steam, and I felt like a new woman the next morning after the workout on the dance floor. We did the morning Nav meetings and then dropped the mooring lines around 8:30 am and set sail for Tobago Cay. It was a beautiful day, with 12-18 knots of breeze on a broad reach. Aboard Jean Harr2, we had quite a bit of excitement when Duane’s fishing line started whirring out. He ran to the rod and began a half-hour battle: Duane vs. Fish. Elizabeth was at the helm, Katrina was beaming with pride and ready to lend a hand, Chad was documenting everything on the GoPro, Nate was there to provide a quick respite for Duane, and I was saying things that made it apparent that I know nothing about fishing! Duane reeled it in close enough to the aft port hull for Nate to recognize it as a sailfish before the line broke…all recorded on the GoPro for posterity. “That makes the whole trip right there!” Duane enthused, and before long he had another lure out. The sail was a good one too, and we all gathered at the entrance to the North Channel of Tobago Cay and entered, ducks in a row, met by boat boys who led us to moorings. The fellow we got, Neil, was very helpful over the next two days. We snorkeled off the boat and then some people went in search of more turtles by dinghy and we all enjoyed time doing what we wanted to do. That evening, we hosted a cocktail party aboard Jean Harr2 and it was fun to all be together! After Nav meetings, we sailed a short distance under genoa only to Clifton Harbour to check into Union Island. We got to practice our Mediterranean mooring at the Bougainvilla Docks, where we filled up with water and got ice and other provisions in town. 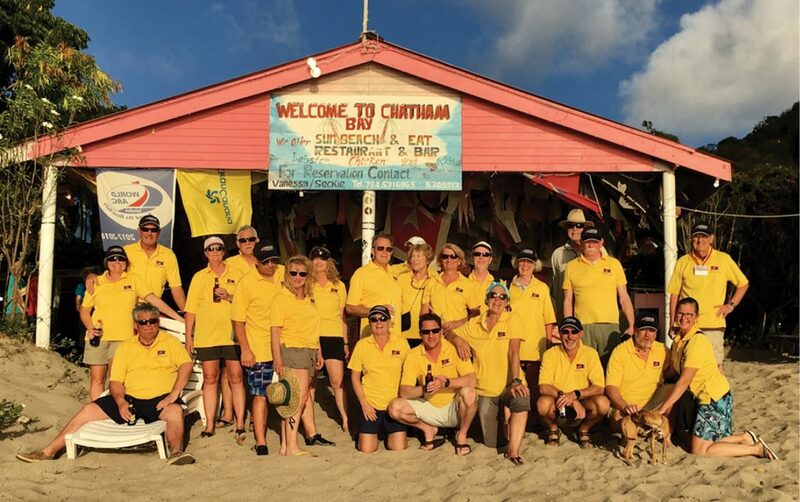 We disembarked in short order and sailed around Union Island to Chatham Bay on the west side. This is a lovely protected anchorage and we all enjoyed a beach barbeque at Vanessa’s. It was a good meal, cooked by a pirate, and we all had a good time. Beware: Don’t stand downwind of a pirate when he’s smoking…this is the islands, mon! We had a choice of lobster, mahi mahi or ribs with cole slaw, garlic potatoes and veggies. It was delicious and we were treated to another stunning sunset. We enjoyed a leisurely morning in Chatham Bay. We dinghied into the Resort Dock, and Elizabeth and I walked the beach collecting sea treasures and snorkeling the reef just off the beach. By 11:30 a.m. we were underway, sailing on a broad reach towards Tyrell Bay on Carriacou, where we planned to check into Grenada. Little did we know it was their Independence Day and the bureau was closed, so we explored the town, swam, walked the beach and met up at the Slipaway Café where the owner made the best virgin piña colada I’ve ever had. Contributions for the Slipaway Café’s WiFi go to the Carriacou Children’s Fund. Nate and I gathered with Scott, Maureen and Eric, Jan, Chad, Katrina and Duane, and had a good old time. We were back aboard in time to watch the sunset, and Nate and I saw a real GREEN FLASH for the first time in our lives! It’s said that if you see a green flash at the same time as another, then you are truly in love. We ate dinner aboard that night and Duane and Katrina treated us to fresh mackerel they’d bought on their speedboat ride back to Clifton Harbor to check out a kiteboarding resort they’ve been looking at online for over two years. While preparing our meal – broiled mackerel, lentils, yellow rice, salad and steamed carrots – Katrina, Duane and I were bumping into each other in the galley. Chad picked up on that and played a polka to add to the frenetic activity. Duane recalled that cooking was always like that when he was growing up, with all the kids and his mom running around doing different tasks. That is one thing I love about these flotillas; I develop a deeper understanding of the various ways in which we were all raised and hopefully that leads to a greater tolerance of our differences, and compromise. Open Minds, Open Hearts. The skippers checked us all out of customs early, which was good thinking because there was a backlog due to the holiday the previous day. We were underway by 8:45 a.m. and sailed another spectacular weather day, broad reaching with 11-17 knots of breeze and 5-6 knots of speed. It was an open passage but it was fairly calm, and we arrived at Dragon Bay to find that the six mooring balls were really only two and one was taken, so we anchored. Keys to a successful sailing vacation are flexibility and managing your work-arounds. We took the dinghy around the point to the south and went snorkeling in the underwater sculpture park. I thought it was very cool. We had gotten a lot of mixed information about this anchorage but in the end, decided to stay put as the sun was setting. As it turned out, it was like sleeping in the agitate cycle of a washing machine. For our last dinner aboard, Nate cooked delicious carbonara and we played a card game that Chad introduced us to called “Screw your partner, screw yourself” or something like that. We did laugh a lot! This article is excerpted from the author’s Offshore Sailing School Flotilla Blog and is reprinted with permission. To see more, log onto OffshoreSailing.com and click on both “Adventure Vacations” and “Colgate Blog” tabs.